As Dubai is an extremely graceful city, you will definitely be awestruck by its outstanding architecture, shopping centers as well as towering skyscrapers. The city has emerged as one of the leading tourist destinations as people prefer to come here from all over the world. Even the tour packages that you will find in Dubai are custom built according to your requirements and budget. After the exhausting preparations of a wedding gets over, the time comes when every couple wants to relax and enjoy. So, after your wedding gets over, if you are looking for a splendid honeymoon plan, it will be best if you choose Dubai as your destination. This is a city that will offer you relaxation and enjoyment equally. You can choose to be part of a Dubai dhow cruise to take an amazing ride in the waters and see the delights of the city. When the boat gradually glides down along the Dubai tunnel, it will allow you to have the best views of the emirate’s architecture. You will also see the shining stars in the sky that will make the atmosphere all the more amazing. You can feel free to choose various Dhow cruise packages according to your requirements. As you can also book for these packages online, the work has become easier for you. If you are really interested to explore the desert and Arabian waters together, nothing can be better than visiting the city of Dubai. Dhow cruise in Dubai is perhaps one of the most romantic and beautiful ways to experience the city. 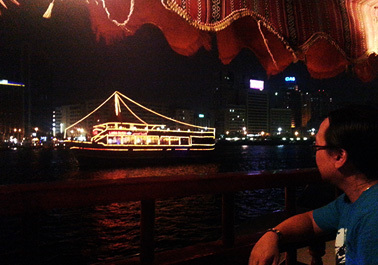 As a major attraction, the dhow will sail along Dubai Creek at night and provide you a fantastic view. You will get to see numerous landmarks, some of which are considered to be the most notable in the city. The Dhow cruise tours in old Dubai will give you a chance to view the monuments and old buildings that reflect the glorious past. When you take a ride to new Dubai, you will also get a unique experience of beauty and lavishness. When you select to take a Dubai dhow cruise ride, you will also get the facilities of delicious food and beverages. You will be provided with various entertainment options that will give you a truly memorable experience. As cruising through the waters will allow you to see the most interesting landmarks, it will give you the opportunity to take the best photos. So, choose to take a ride in Dhow cruise during your honeymoon in Dubai and have an experience of a lifetime.